BCL6 antibody recognizes B-cell lymphoma 6 protein, also known as B-cell lymphoma 5 protein, B-cell lymphoma 6 protein, B-cell lymphoma 6 protein transcript, BCL-5, BCL-6, cys-his2 zinc finger transcription factor, or lymphoma-associated zinc finger gene. Mouse anti Human Bcl-6 antibody recognizes Bcl-6, also known as B-cell lymphoma 6 protein, B-cell lymphoma 5 protein, B-cell lymphoma 6 protein transcript, cys-his2 zinc finger transcription factor, lymphoma-associated zinc finger gene on chromosome 3, protein LAZ-3, zinc finger and BTB domain-containing protein 27, zinc finger protein 51 and zinc finger transcription factor BCL6S. Encoded by BCL6 gene, the B-cell lymphoma 6 protein is a zinc finger transcription factor and contains an N-terminal POZ domain. This protein acts as a sequence-specific repressor of transcription, and has been shown to modulate the transcription of START-dependent IL-4 responses of B cells. This protein can interact with a variety of POZ-containing proteins that function as transcription corepressors. BCL6 is found to be frequently translocated and hypermutated in diffuse large-cell lymphoma (DLCL), and may be involved in the pathogenesis of DLCL. Alternatively spliced transcript variants encoding different protein isoforms have been found for BCL6 (provided by RefSeq, Sep 2008). 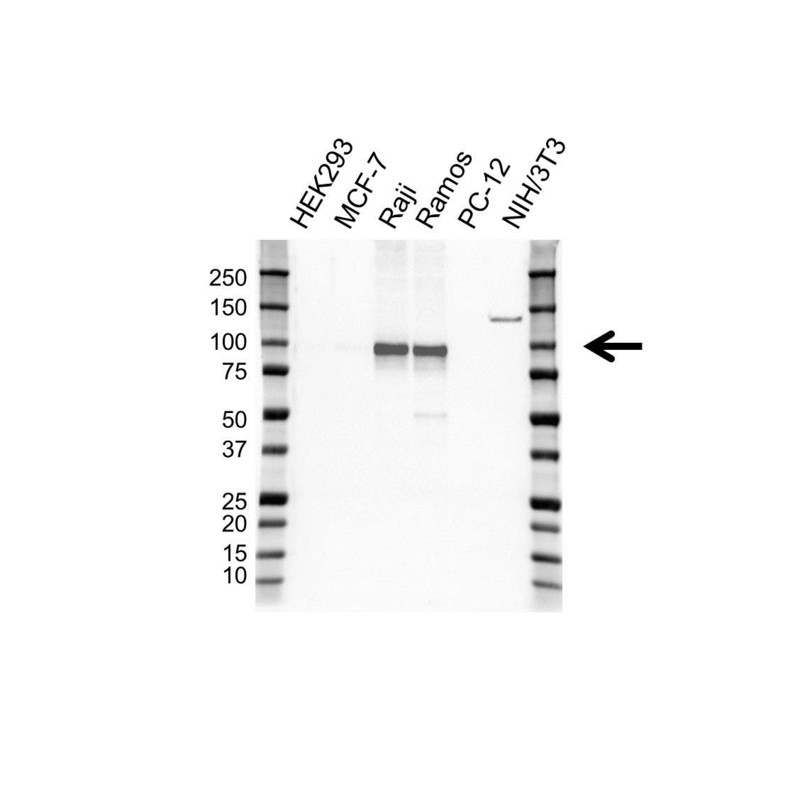 Mouse anti Human Bcl-6 protein antibody detects a band of 98 kDa. The antibody has been extensively validated for western blotting using whole cell lysates.